Send us the worst, most offensive, egregious pink ribbon products or promotions you are seeing. Member input is vital to our campaign planning. What pink ribbon products and promotions are you seeing that push empty “awareness,” spread misinformation, simply boost corporate profits, increase our risk of breast cancer, degrade women, and obscure the harsh realities of the disease? Join us in pushing back on pink ribbon promotions that prioritize corporate profits and do nothing for women’s health. Send your examples to Alyssa Figueroa, BCAction’s Campaigns Coordinator. Support our activism by starting your own “Don’t Pink for Me©” fundraising page. Each year members like you tell us your friends and family want to support you. Don’t Pink for Me© emerged as a direct response to everyone who is tired of Big Pink. Help keep us independent by asking your community to make a donation to Breast Cancer Action in your honor instead of buying pink ribbon products. It’s easy! Just go to https://www.classy.org/campaign/dont-pink-for-me-2018/c192105/ to create your fundraising page today. Help us meet our fundraising goal in June. We depend on you, our members, who join us to demand accountability and transparency from corporations and charities engaged in pink ribbon marketing and promotions. 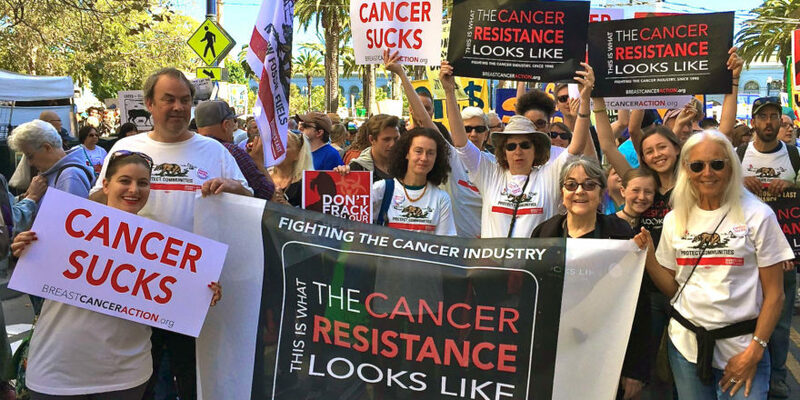 You are the reason we can go toe-to-toe with the cancer industry. You are the reason we are independent and able to do this vital work that no other breast cancer organization is doing. Thank you for joining us to stand up to pink profiteering in the name of women’s health. This entry was posted in BCA News, E-Alerts.